We’d love your help. Let us know what’s wrong with this preview of Fading by Cindy Cipriano. Leath Elliott is a seventeen year old competitive shooter living with her mother in Woodvine, North Carolina. Leath's father was killed in a tragic accident when she was fourteen, and her friend Victor Santana has been there for her every step of the way since. But the friendship changes when Victor starts to have deeper feelings for her. If that wasn't complicated enough, Leath Elliott is a seventeen year old competitive shooter living with her mother in Woodvine, North Carolina. Leath's father was killed in a tragic accident when she was fourteen, and her friend Victor Santana has been there for her every step of the way since. But the friendship changes when Victor starts to have deeper feelings for her. If that wasn't complicated enough, newcomer James Turner wanders into her sights...an emancipated minor with a dark past, Leath is captivated by him and wonders if he might be the boy of her dreams - literally. To ask other readers questions about Fading, please sign up. I loved this book! Couldn’t put it down once I started reading....even stayed up late reading, which I never do! The characters and story line were easy to connect with and I would highly recommend this book for teenagers and adults. The concept of the story is pretty amazing and I am looking forward to the next book in the series!! This is a great book for those who love teen paranormal fantasy stories. Cindy Cipriano remarkably weaves both plot and characters together to grab your attention and take you on a journey of intrigue, love, suspense, and paranormal behavior. The pace of the story keeps you engaged as you gain a new insight on the power of love, loss, and alternate reality. Fading is a charming story of teenage love and longing narrated with much warmth and sparkle. Leath, a seventeen-year-old high school student, has fallen out of love, if she ever has been in love, with Victor, a Spanish boy and longterm friend devoted to her. Leath is searching for fulfilment, in whatever form that comes. Then a new boy, James, starts at the school and Leath falls in love. James has lost both his parents, Leath has lost her father. United at first by a shared grief and a deep at Fading is a charming story of teenage love and longing narrated with much warmth and sparkle. Leath, a seventeen-year-old high school student, has fallen out of love, if she ever has been in love, with Victor, a Spanish boy and longterm friend devoted to her. Leath is searching for fulfilment, in whatever form that comes. Then a new boy, James, starts at the school and Leath falls in love. James has lost both his parents, Leath has lost her father. United at first by a shared grief and a deep attraction, as Leath gets to know James more and more, all is not as it seems. Meanwhile, Leath is torn between her love for gorgeous and mysterious James and her lingering attachment to soft and reliable Victor. This is a heck of a hook! The Fading has the elements of a teen romance drama. The protagonist is at a turning point in her life; she has a guy friend who's on the verge of something more; and a new boy moves to town. But it has just enough hint of the supernatural to keep me wondering. More than that, there is a constant air of danger. This is one of the VERY FEW romance books involving a dark figure where I actually felt that said dark figure was legitimately terrifying. There's really no knowi This is a heck of a hook! The Fading has the elements of a teen romance drama. The protagonist is at a turning point in her life; she has a guy friend who's on the verge of something more; and a new boy moves to town. But it has just enough hint of the supernatural to keep me wondering. More than that, there is a constant air of danger. This is one of the VERY FEW romance books involving a dark figure where I actually felt that said dark figure was legitimately terrifying. There's really no knowing where the story will end up until it takes you there. The only reason this doesn't get five stars is because I felt I was being told things I could have been shown. There was so much mystery and implication in the book, but at times the narrative took time aside to explain emotions that could have just as easily been mysteriously implied like so much else. Such a great book! Could not put it down. Cannot wait till the next one in the series comes out. Fading is a YA romance novel with a paranormal twist. It was a great pleasure to read this book and find a delightful romance with a splash of mystery. The story begins in the junior year of high school, hanging out and daydreaming in Woodvine. Leath Elliott is 17 and facing a new year at school which includes all the emotional mayhem of the real world. The real world hasn't always offered her the best, so she finds herself remembering a boy who always came to her dreams at night. One could say, Fading is a YA romance novel with a paranormal twist. It was a great pleasure to read this book and find a delightful romance with a splash of mystery. The story begins in the junior year of high school, hanging out and daydreaming in Woodvine. Leath Elliott is 17 and facing a new year at school which includes all the emotional mayhem of the real world. The real world hasn't always offered her the best, so she finds herself remembering a boy who always came to her dreams at night. One could say, they grew up together. When a new boy James Turner arrives at the school, she finds something uniquely familiar about him. One of Leath's gifts was the ability to recognise a person's scent. James captures Leath’s attention much to the annoyance of her best friend and love interest, Victor, building the tension between the two young men. As James spends more time with Leath a budding romance begins. As they get to know each other it feels like they have known each other for the longest time. Cipriano creates a wonderful foundation for the mystery to unfold. The characters are fleshed out nicely with glimpses of a mother and daughter relationship filling the pages with depth and feeling. The romantic relationship with James builds but new factors come into play as her childhood dreams return. It then becomes a dance between truth, love and decision. A choice between two young men who offer her very different alternatives in life. This is an enjoyable romantic story for anyone who loves a good YA romance. I thoroughly adored it. Good young adult fantasy romance! Leith has grown up dreaming of a young man who always made her feel safe and loved. She had friends and a loving mom. Life seemed almost perfect. When James starts at her school, he seems so eerily familiar...she has no idea!! I enjoyed this book and I'm looking forward to the sequel! The ending twist thing was gooood. A little sappy, creepy and just oddly situated in places. Not a big fan of this.writer. A friend asked me to download her sisters book so I did. I was pleasantly surprised at how much I enjoyed this book! I can’t believe how fast I became hooked on this book, by page four I was lost.. I am so looking forward to reading the next book in this series..
Great book with well written characters. It’s nice to have a female lead with her own strength. I read the book in less than a day. I highly recommend to anyone who loves a YA romance with a twist! P. S. I pick James. The link button to review was not working and asking for "your pubic name". From my Kindle App. Never had that happen. Hopefully that's not happening to others. So I came hear to review book. I really like the imagination of this author. The world or space between ours and others is so uniquely woven. This is a great Ya book. The emotional episodes between the characters were a little tiresome but she explained the reason or the pull. To dream of your true love and what follows is heart racing. I loved Fading so much. The characters are so well written, and the story is the best kind of intense. I can't wait to read the next book. I will never stop loving these characters. Not even in death. I definitely recommend. Well done, Cindy! I enjoyed reading this and look forward to reading its sequel. I especially love the quote on page 98. "Don't ever let fear rob you of something you want. Fear is just the flip side of excitement. Exhale the fear and breathe in the excitement." This was a good read. A true love story. Plenty of twists. Definitely for teens. Not sure if I’ll read the next one. 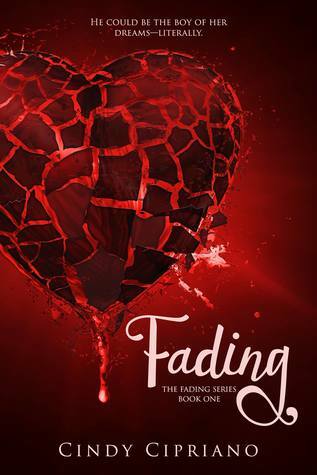 I was given the honor of reading and reviewing Fading by Cindy Cipriano. While Fading is a YA book, that is not all it is. What would do you are faced with the possibility of finding the boy of your dreams? Literally, your dreams?? That is what happens to Leath Elliott. 17 year old Leath is facing her senior year with her best friend, Victor Santana. As we all know being a senior brings out so many emotions. Each a little scarier than the last when we realize that soon we will be out in the real I was given the honor of reading and reviewing Fading by Cindy Cipriano. While Fading is a YA book, that is not all it is. What would do you are faced with the possibility of finding the boy of your dreams? Literally, your dreams?? That is what happens to Leath Elliott. 17 year old Leath is facing her senior year with her best friend, Victor Santana. As we all know being a senior brings out so many emotions. Each a little scarier than the last when we realize that soon we will be out in the real world, all alone. For Leath this is all even scarier, as she lost her father when she was young and Victor was all that she had other than her mom. Then out of no where James Turner enters her life. He is everything she has dreamt of. Leath feels emotions for James that she has no clue how to figure them out. It seems like they have always known each other. He has some uncanny built in knowledge of her. Cipriano builds the mystery of who James is so beautifully. It draws you in deeper and deeper, until you realize you have to know. When you finally know you are left with a decision that is so complex I don't think I would know what to do. To choose between the love of my dreams or the love of my reality, who can seriously do that?? Leath is scared of what her choice will do to both young men. Yet, in her hearts of hearts, she knows who has completely captivated her heart and soul. She needs to get. With the beautiful characters and relationships that Cipriano has built up in Fading you won't be able to wait until the next book in the series. While Leath makes her decision (sorry ya'll know I don't do spoilers) would you make the same one?? For me, Fading was a sweet love triangle that made me want to actually be back in high school (did I really just type that??) for a few brief moments. I truly enjoyed and recommend Fading. It is a book that any young teen to grown woman would enjoy disappearing into. Too much telling rather than showing and the opening scene between the MC and the friend felt useless since it's highlighted in the blurb that she wants to be with the new guy. This was a DNF for me. Just two dogs who think they are children and three cats who think they are raccoons. It only seems as if they make 27. When Cindy isn't writing, she enjoys spending time with her family and the avoidance of cooking. Cindy's YA series, The Fading Series, released in 2018 with Fading, Book One. Look for Sear Cindy Cipriano lives in North Carolina with her husband, son and their 27 pets. Cindy's YA series, The Fading Series, released in 2018 with Fading, Book One. Look for Searching, Book Two in e-book format on 7/20/18 and the paperback in February 2019. The Fading Series is published by Clean Teen Publishing. Fading is the tale of first loves and the consequences of dreaming up Mr. Right. Cindy's Miller's Island Mysteries series blends science and fantasy. Titles include #1 The Case of The Toxic River, #2 The Case of the Mysterious Future, and #3 The Case of the Magnetic Rocket Fuel. There will be eleven books in this series published by Vulpine Press.